A research team led by Leigh Orf from the University of Wisconsin-Madison’s Cooperative Institute for Meteorological Satellite Studies (CIMSS) has used a high-efficiency supercomputer to visualize the inner workings of tornados and the powerful supercells that produce them. As part of the project, the researchers recreated a tornado-producing supercell that devastated the Great Plains six years ago. Their new models are providing fresh insights into these monstrous storms and how they form. During a four-day stretch in late May 2011, several tornadoes touched down over the Oklahoma landscape. One of these storms, dubbed “El Reno,” registered as an EF-5—the strongest category on the Enhanced Fujita scale. This beast of a tornado touched down near Hinton, Oklahoma, where it proceeded to blaze a trail of destruction for nearly two hours. By the time it was over, the storm caused extensive damage along a 63-mile (101 km) long path, killing nine people and injuring 161 others. 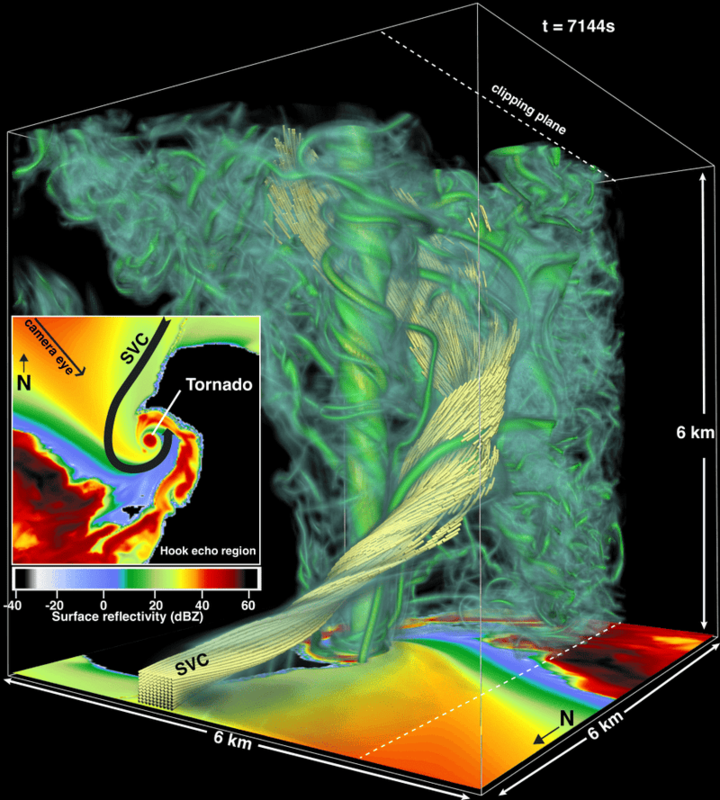 To simulate the incredibly complex set of meteorological factors required to produce this particular tornado, Orf’s team was given access to the Blue Waters Supercomputer, located at the National Center for Supercomputing Applications at the University of Illinois at Urbana-Champaign. Orf’s team used real-world observational data to recreate the conditions at the time of the storm, including a vertical profile of temperature, air pressure, wind speed, and moisture. Together, these ingredients contribute to “tornadogenesis”—the conditions required for a supercell to spawn a tornado. Unlike a conventional computer program, where code is written to churn out predictable results, the researchers sought to create a “true” representation by feeding archived weather data into software that simulates weather. This provided a degree of variability that’s reflective of how weather works in nature; no two storms are exactly alike. In total, it took the machine more than three days to compile the tornado—a task that would have taken decades for a conventional desktop computer. Looking at the simulation, the researchers observed numerous “mini tornadoes” that formed at the onset of the main tornado. As the main funnel cloud took shape, the smaller tornadoes began to merge, adding strength to the superstructure and boosting wind speeds.